Arteriosclerosis or hardening of the arteries, also known as atherosclerosis, occurs when plaque, caused by excess fat and cholesterol, builds up inside the artery wall. When this plaque gets thick and hardens it eventually blocks the arteries. This blockage prevents blood from flowing freely to the heart, causing chest pain, angina, shortness of breath, and even heart attack. There is also a danger of blood clots developing, which can clog up the lungs, causing pulmonary embolism, or lodge in the heart or brain, causing heart attack or a stroke. Diabetes, high blood pressure, high-fat diet, high cholesterol, obesity and smoking are all risk factors for atherosclerosis. The condition has also been linked to cerebrovascular and peripheral vascular disease and kidney disease, especially if dialysis is needed. As with many such conditions, there is often a genetic link so, if you have a family history of heart disease, or any of the above conditions, you should implement preventative measures as early as possible. Everyone starts to develop some plaque in their arteries, as they grow older. Some of the complications of arteriosclerosis can be very serious and, as mentioned above, it is important to see your doctor if you suspect that you are suffering from this condition. While exercise is recommended, it is also wise to see your doctor, if you have not been exercising regularly, before embarking on any strenuous exercise programme. However, there are several life style changes that will help prevent this condition from developing and which are also recommended to prevent other age-related conditions, such as high blood pressure, diabetes type 2 and obesity. Change you eating habits so that you choose low fat, low-cholesterol, and low-salt options. Eat fish at least twice a week – steamed or baked rather than fried fish in order to get full benefit. If you do not like fish or it is too expensive for your budget try a fish oil supplement. Exercise at least 30 minutes every day, more if you are overweight. Start with mild exercise like walking, before building up to moderate and strenuous. Stop smoking completely and drink alcohol only in moderation. 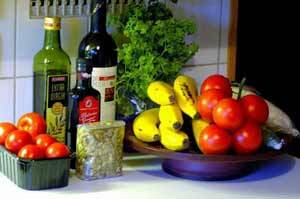 A Mediterranean diet appears to lower the risk of hardening of the arteries and heart disease. A glass or two of red wine can also be helpful, but more than two glasses a day is not recommended. Make sure that you follow your treatment for high blood pressure if you suffer from this condition. Aspirin can help some people reduce the risk of heart disease and stroke. Some people take an aspirin as a preventative measure if they are flying long-haul, when lack of movement might cause a blood clot. Taking an aspirin and doing small sessions of exercise during the flight can be helpful. However, aspirin should not be taken by anyone who has a stomach ulcer. As mentioned above, it is imperative to consult a doctor, rather than try and treat yourself if you have any suspicion of Arteriosclerosis. Mary Treacy is the founder and contributing editor of age-well.org She has over 30 years of experience working with non-governmental organizations, mainly business associations, and is an experienced writer in many sectors including co-operatives, agriculture, commmerce, housing, insurance, banking and health. You can find her on Google + and Twitter.